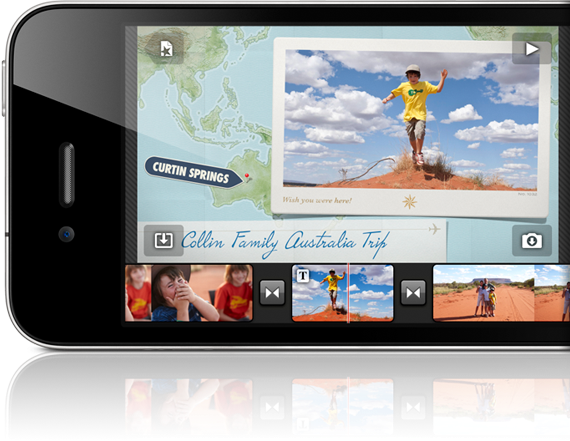 iMovie – a new app introduced with iPad2, now available for iPhone 4! iMovie is a video editing application designed by Apple. iMovie is also the name of the video editing software included in iLife, which is bundled with every Mac. iMovie needs the extra RAM and Apple A4 processing power to operate. iMovie is similar in nature with most of Apple products, as it’s very easy to use and contains fairly intuitive menu. The app can be used both in portrait or landscape mode, and completes your commends with a simple (one or double) tap. Editing mode, aligned right in the top centre of the screen shows your “masterpieces” with a timeline and sliding options. you can add videos, photos and music to your movie. The photos are listed in chronological order, while the videos are presented in reverse order. A bit strange, isn’t it?! With IMovie you can drag clips around, spruce the edges of clips, add captions, swiftly switch between themes, and make slight edits to transitions. You can remove a clip or photo by just dragging it from the timeline. Another strange thins with the iMovie concerns the title changing options- because of unidentified reasons you are not able to change the title length. they automatically equal to the length of the clip you have the title attached to. Even though there are a few little things missing from iMovie, it is still the most convenient app for video editing. As it is the first version of iMovie, let’s be less strict and critical, even because it costs only $4.99 in an Apple store. Titles last the entire duration of clip, with no option to set the length.